I usually find it hard to pinpoint my “favourite” things… Those who know me know that anything I happen to like is my “favourite”… but I do think one of my favourite things about travelling in Asia is the food. And no, this surely isn’t a very controversial opinion otherwise every city in the word wouldn’t have a Chinatown, and one of the most popular cuisines here in Australia wouldn’t be Thai food, and the grooviest foodie streets wouldn’t be strewn with Vietnamese restaurants. Here in Adelaide, the turnout to festivals like OzAsia or IndoFest would probably be lower if our foodie culture didn’t exist. Anyway… let’s talk about a great passion (or obsession, whatever) of mine right now – Asian soups. I cooked a Tom Yum last night, and I love a good Laksa, but I’ve been trying to perfect pho lately. During this process I’ve learned something: you can’t “perfect” the recipe. 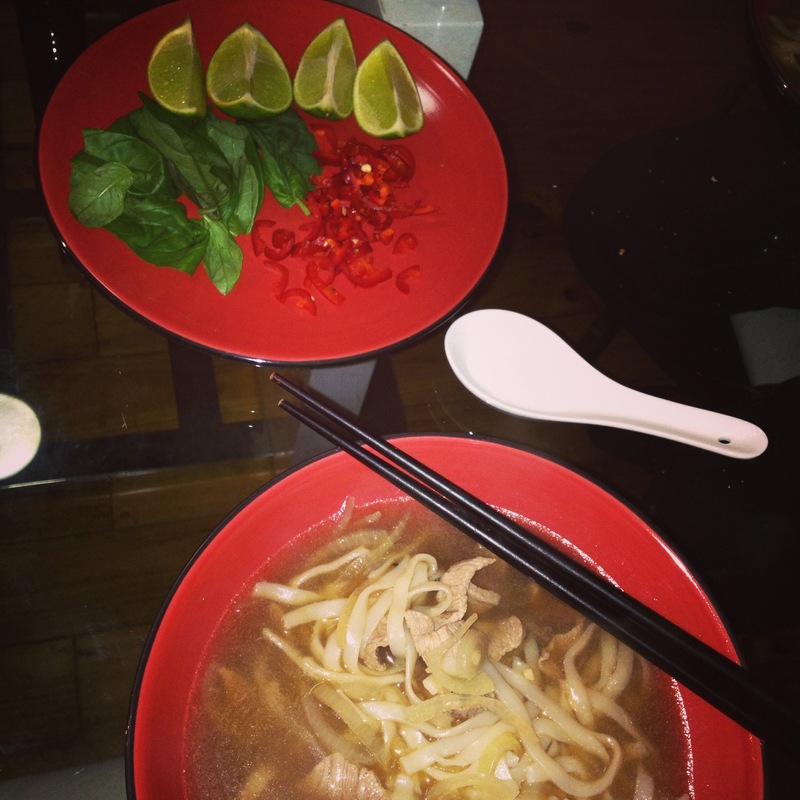 When I got home from the latest jaunt to Vietnam, I scoured the internet for a good pho recipe. A lot of them had star anise in them, which I hate, and they just didn’t taste right (I honestly don’t recall eating one that tasted of star anise over there, but here it’s quite common). I’m discovering that making it to taste, rather than following strict guidelines, is working much better. Then you serve it all up with lots of extras to add in (basil, fresh chilli, fish sauce, lime) and mix it all up until no-one’s bowls taste the same. So what I want to know from everyone is: do you rely on recipes? Do you make a good pho? And if you do, what are the real essentials in your opinion? Okay… GO! ← Business Class pyjamas: Bob Carr says yes!